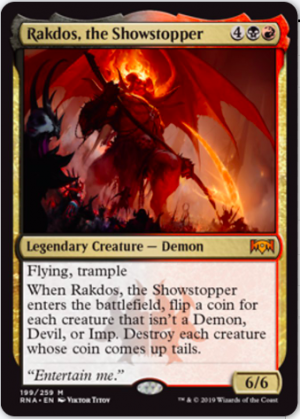 Spoilers for Ravnica Allegiance heated up in a big way this week and, wow, did EDH get some love or what!? 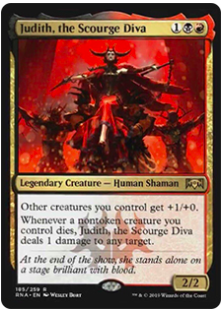 For a few hours, Judith, the Scourge Diva was the talk of the town; then Teysa Karlov; then Rakdos, the Showstopper; and finally Prime Speaker Vannifar! QS Insiders alerted each other on the QS Discord channel, allowing many to grab their copies before the significant increases occurred, but there was really no way to get this information into an article in time. I cannot stress this enough: please consider signing up for QS Insider to gain access to the information in real-time (if you are an Insider, please be sure to join the Discord and maximize your value! Instructions can be found here). The above two cards were called almost immediately, and if you were on the QS Discord prepared to buy in response, you literally could pay for a six-month QS Insider subscription with just a playset of Intruder Alarm profits. Unfortunately, we all know new and desirable EDH generals spark a handful of buyouts during spoilers, but I will be writing a few articles over the next week to cover the additional cards our new generals could make relevant and which are currently under the radar. The color combination of black and white has historically been tough to play in EDH. There haven’t been many great generals available to Orzhov players, and a quick review of EDHREC two-color commanders confirms only Boros has a lower count for its top general (Aurelia, the Warleader, 913 decks compared to Athreos, God of Passage, 1324 decks). Much like the guild itself, Orzhov EDH players have always been starved for direction. The Orzhov commanders lack a consistent theme and strategy to get brewers excited – that is, until Teysa Karlov was spoiled. Mixing the flavors of white and black magic, Teysa’s two abilities perfectly complement what she represents to Orzhov and who her character is in Magic Lore. 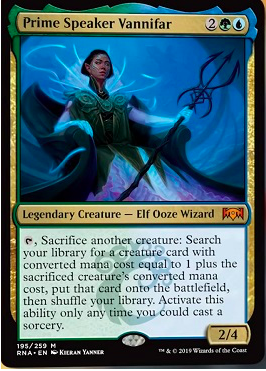 She brings to life the Orzhov-trait of doing deals with the dead by facilitating an EDH-aristocrats strategy, and she also connects life and death by empowering the resurrected (tokens) with human elements (giving them vigilance and lifelink). The two abilities, while flavorfully intended to be contradictory like the Orzhov colors themselves, work wonderfully for EDH purposes. Early indications are that Teysa Karlov and Prime Speaker Vannifar have a foothold as the two Ravnica Allegiance favorites in the EDH community (note: there is always the possibility for another spoiler to change this!). She allows players to have differing strategies (tokens matter; heavy aristocrats; somewhere in between; etc.). She provides support to one of the two least represented color combinations in the game. Prime Speaker Vannifar immediately strikes me as a toolbox commander that doesn’t leave much room for brewing once the winning lines of play are identified. 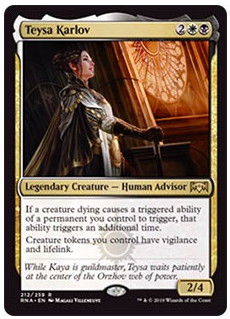 With regard to writing about both of these commanders, it will be much easier to discuss Teysa Karlov in an article given the more open-ended realm of possibilities she creates and because of the knee-jerk reactionary buying Vannifar will create moving forward. Brewing with Teysa will be at the player’s discretion and thus, I think Teysa will appeal more prominently to the casual EDH crowd. Prime Speaker Vannifar, on the other hand, will be extremely competitive and likely refined down by competitive EDH players to the optimal build that consistently wins by turn three or turn four. This could hinder the possibility of a casual approach to Vannifar and inherently also ruin her perception in EDH circles over the long run. I’ll be focusing on Teysa Karlov specs for now, but I encourage you to stay active on the various MTG finance mediums to keep a pulse on what cards are next to spike because of Vannifar. I am warning you that those cards will be overnight spikes rather than consistent, steady gainers. It can be great if you are able to time it on something like Intruder Alarm the moment the community realizes it is a key component to the optimal Vannifar build, but without something like the QS Insider Discord or a comparable medium where the information is quickly relayed, it can be very challenging. I will do my best to relay Vannifar-related information via my Twitter account and on the QS Insider Discord, but I do not anticipate covering her much in articles moving forward. There might be a few ways to maximize Teysa as your general, but the most obvious seems to be an aristocrats-token build. As such, I’m going to lay out a few speculation targets which 1) could be auto-includes in a Teysa Karlov aristocrats-token strategy 2) are in limited supply (either because of rarity, small print runs, or both) and 3) are likely to see surges in price as EDH players pressure supply and acquire their copies. The first card I’d like to discuss for Teysa is Second Sunrise. I spent most of my opening discussion about Teysa talking about her aristocrats-flavor and the ability to appease the graveyard in exchange for value, but what better way to abuse those payoffs than by getting the sacrifices back and doing it again!? I think Second Sunrise will play perfectly in any Teysa shell as a way to gain card advantage and amplify the value of the sacrifice-targets that benefit from Teysa. I gave it a conviction of three because it has an existing home in Group Hug decks, albeit only in 1,450 total decks according to EDHREC; it is from a small, single print run in Mirrodin; and it could see newfound demand sparked by a newly spoiled card, Teysa Karlov. The nice thing is Second Sunrise doesn’t have to be an auto-include in Teysa (though I think it should be) to put pressure on the already low supply of foils. I plan on picking up some LP to NM foil copies of Second Sunrise between $4 (LP) and $8 (NM) with a six-month maturity in mind and a target exit between $10 and $15. Black Market is one of those cards where you look at it and think, “Wow, black has enchantment-based mana ramp?” I think Black Market is criminally underplayed in EDH and should actually be in far more decks than it already is (roughly 10K on EDHREC). We won’t be talking about Judith, the Scourge Diva in this article, but note the dual synergy of Black Market with her as well. I give Black Market a four on the conviction rating scale because I truly believe it is a budding EDH superstar. The fact that it got two separate color-matched commanders which both enjoy death speaks volumes to its potential. It already has multiple homes in EDH and it comes from an older print run (Mercadian Masques) and two supplemental Commander Series (2014 and 2017). Additionally, the foils are from the old border process and are a shoe-in to touch $75 or more for NM copies in due time (because of the foils being from an old set, they should be surprisingly reprint-resistant as well). It slots perfectly into Teysa Karlov decks because her triggered ability will give Black Market two charge counters, thus providing a significant mana ramping mechanism to transition from early game to late game. I plan on picking up NM non-foil copies from any of the three print runs (Commander 2014, Commander 2017, and Mercadian Masques) at $4 (NM) with a six-month maturity in mind and a target exit between $7 and $10. I may also dabble with a near mint foil if I can find one, targeting an entry at $40 and out between $80 and $100 (also with a six-month maturity in mind). Flesh Carver is about as “early mover” as it gets; it can be found in bulk bins everywhere, and online it ranges from $0.35 to $0.50 pretty consistently. While it doesn’t have any concrete EDH home today (~1,100 decks on EDHREC), it does appear to have found one with Teysa Karlov. Flesh Carver does exactly what you want to be doing in your Teysa strategy: sacrifice stuff (Flesh Carver can activate that for you) and get double the payoff in exchange (Flesh Carver also does that for you!). At its current “penny stock” buy-in level, I think this is an easy money-maker within six months’ time and a risk-averse play at that. I will be grabbing 20 NM copies of Flesh Carver for $0.50 and target an exit at $4, or via buylist if they get to $2 cash (I would actually take the store credit bonus to maximize value). Flesh Carver is a wonderful card for those of you who may be new to MTG finance. It is the type of card that allows you to dabble with MTG finance without worrying about spending a lot of money or having a lot of downside risk. Bulk is bulk, after all, and worst case you are out roughly 50% of a $10 investment after buylisting. The flip side is you quadruple your investment after fees, outing $0.50 copies at $4, or take store credit and turn the profits into a new spec. I cannot express in words just how thrilled I am to see these new Ravnica Allegiance generals in action! The support for a few previously underrepresented guilds is exciting, and I am also anxious to see what the rest of spoiler season brings us. We covered a few actionable cards for Teysa Karlov EDH, and I also mentioned the importance of monitoring real-time mediums (Twitter, QS Insider Discord, Reddit, etc.) for breaking news on cards discovered for Prime Speaker Vannifar. Please feel free to DM me on Twitter (@ChiStyleGaming) or in the QS Discord (@Chris Martin#5133) if you have any questions, concerns, or feedback about the article. I would love to hear from you! Otherwise, as always, see you on the battlefield!